Map shows where off-campus college students live in the cityWith college and university enrollment all but stagnant, only 32 percent of the nearly 149,600 undergraduate and graduate students in Boston live on a campus, according to the city’s third annual assessment of housing trends for the 2016-2017 academic year. Other data show that Dorchester has dropped off the list of Top 10 neighborhoods for off-campus student housing. The study draws from information supplied by Boston-based institutions of higher education who provide the city with the addresses and academic standings of all enrolled students, along with any information on university-owned or leased properties. Boston has collected and compiled this data since 2014, when officials were expressing concerned about the city’s lack of information about students packing into unsafe residences, particularly after the death of 22-year-old Boston University student Binland Lee in a 2013 fire at an off-campus home in Allston. About 74,000 greater Boston students – just under 50 percent – live off campus in the private housing market, the report shows. Those students have the highest impact on the supply of residential housing that is being squeezed by a growing population and increasing development. Undergraduate enrollment has seen a slight decline. With 92,295 undergrads, the demographic has decreased by 0.5 percent since 2013, a decline offset by a 5.5 percent jump in graduate student enrollment over the same period, now at 57,280. Total enrollment between 2015 to 2016 rose by just 0.1 percent. Although a higher proportion of graduate students live off campus in private residences – about 70 percent in both greater Boston and Boston proper – the undergraduate number is of greater interest to the city. Undergrads have a “greater likelihood of residing in unsafe and unsuitable housing,” and there are quality of life issues when a large number of undergraduates pack into specific neighborhoods, according to the report. Student-dense neighborhoods like Fenway/Kenmore, Allston/Brighton, and Mission Hill account for the majority of undergrad housing. 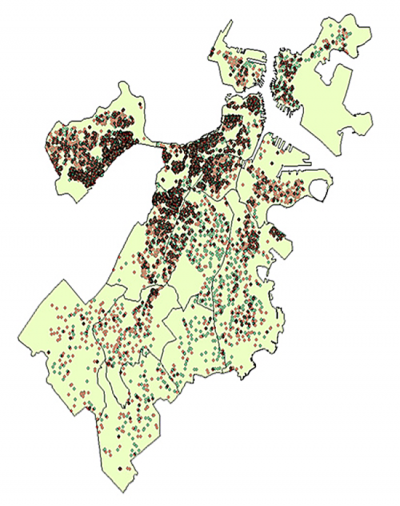 Data from the Boston Planning and Development Agency (BPDA) place about two-thirds of the city’s student population in those areas. Depending on the planning district, Dorchester and Mattapan house either minor or minuscule proportions of the off-campus population. Department of Neighborhood Development (DND) districts count 359 undergraduates and 370 graduate students in Dorchester, with the undergraduates accounting for 1.18 percent of total students; Mattapan is home to 70 and 42, respectively, for a mere 0.23 percent. BPDA numbers show a different balance of students across several additional neighborhood designations. Dorchester, by its count, houses 193 undergrads and 551 graduate students, with those undergraduates representing 2.45 percent of total students. Mattapan drops to 26 and 51 of each, with undergraduates in that neighborhood accounting for 0.04 percent of the city’s student body. Dorchester’s students are spread throughout the neighborhood, with the highest concentrations at Columbia Point, Savin Hill, and around the Polish Triangle. The report also highlights UMass Boston’s recent groundbreaking on a 1,077 dorm-bed residence hall that is expected to be open by fall 2018. It’s one of two projects that will add a total of 2,000 beds to UMass Boston. Enrollment at the Dorchester campus rose by 4.6 percent overall from 2011 to 2016, but dropped by 1.1 percent between 2015 and 2016. Including the dorm beds built since 2011 and planned additions as well as completed and pending demolitions, the city is on track for just under half of its 16,000-bed goal.